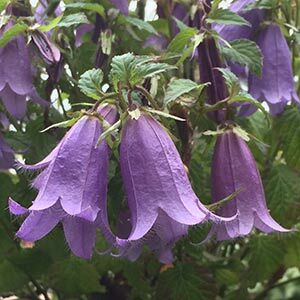 With large lavender flowers that hang in groups, Campanula Barbara Valentine is a relatively new release however we think one of the better bellflowers. The flowers themselves are 4 – 5 cm long with a good shape. A close up look reveals slight ribs and tiny hairs that will gather a little dew in the morning and glisten in the sun. Well suited to growing in a cottage garden, in the general garden border or in very light shade beneath deciduous trees. This is a versatile Campanula, and being of a medium size, fits in with many planting schemes. A humus rich fertile soils best. Dig in some well rotted manure and compost before planting. Mulch around the plant to help maintain a cool root run. Water during long dry spells through summer. Prune back as the foliage begins to die back in autumn. Best in morning sun, light afternoon shade in most areas. Spread – 35 cm. Campanula Barbara Valentine will slowly spread to form a clump. Flowering period – Late summer to early autumn. Foliage – Good mid green. Container growing – We believe its suited if you wish. Available for sale at most good nurseries.